SCVHistory.com JW4401 | Vasquez Rocks | 'Arizona Whirlwind,' Monogram Pictures 1944. 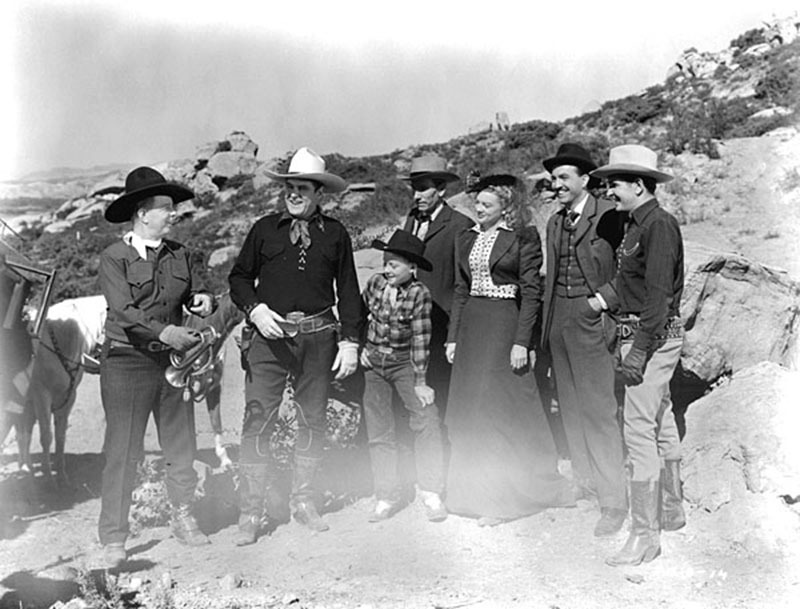 (From left) Hoot Gibson, Ken Maynard, (?boy), Dan White, (?woman), (?man) and Bob Steele at Vasquez Rocks in Agua Dulce, in a scene from the 1944 Monogram picture "Arizona Whirlwind." A "buddy picture" starring Ken, Hoot and Bob as the Trail Blazers. Filmed on location at Monogram Ranch (Melody Ranch) Triple A Ranch (Vasquez Rocks), Corriganville (Simi Valley) and elsewhere around the Santa Clarita Valley, presumably Placerita Canyon. U.S. marshals Ken, Hoot and Bob stop a gang dressed as Indians from robbing the stage. After getting repairs at the relay station, but before they get to town, another trap is set, but they get away. In town, they search the stage and find nothing. But hidden in the axle grease can are diamonds. Polini (Ian Keith) wants them cut into smaller diamonds so that he can easily dispose of them. Image courtesy of John F. White, grandson of Dan White. JW4401: 9600 dpi jpeg from smaller jpeg.